This Cats Got Style took home the top paycheck of $75,000 with a with a 229-point win worth on Friday, December 4, in the 2015 Western Bloodstock NCHA Winter Showdown during the NCHA World Championship & Futurity while two more High Brow Cats made their mark in the Top Ten. High Brow Cat was the most represented sire in the Open Showdown, which has become a showcase for older cutting horses. This Cats Got Style, out of Moms Stylish Pepto by Peptoboonsmal, is at six, a highly trusted mount for trainer Dustin Gonnet who shows the mare for owner Ronald Patton, Nanton, Alberta, Canada. 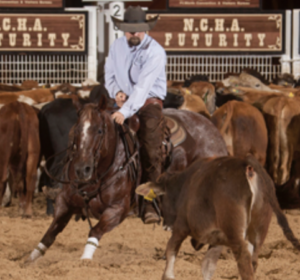 This Cats Got Style and Gonnet won the 2012 Canadian Supreme Futurity and the 2014 Canadian Supreme 5/6 Classic, and took reserve in the 2014 Calgary NCHA World Series. This past year they won the $15,000 Novice championship at the NCHA Western Nationals. Including her Winter Showdown winnings, This Cats Got Style has NCHA lifetime earnings of $175,868. Splitting six and seventh was Cattahoochie, shown by Jason Clark for owners Jerry and Vickie Durant of Weatherford, Texas. The five-year-old by High Brow Cat and out of Marias Starlight by Grays Starlight scored a 217.5 to take home $18,500. Following close behind with a score of 215 was Snap Crackle Cat by High Brow Cat and out of Dual Snap by Dual Rey. Shown by Tatum Rice for owner John C. McClaren of McGregor, Tex., the gelding earned $17,000. The 15-horse field, ranging in age from 10 to four years, was possibly the richest that has ever competed in Will Rogers Coliseum, with cumulative earnings of $2,947,761 and average earnings of $196,517, according to the Sally Harrison blog.